How safe are current temperatures? Global temperatures have increased by one degree in comparison to pre-industrial times and the international community has agreed to limit a further increase to 2 degrees by maximum. This seems to be a resonable aim, if reached. Earth does not necessarily react immediately to changes in temperature, however, and even the current temperature may have unwanted consequences in the future. Hoffmann and colleagues studied connections between temperature and sea levels by analyzing conditions during the warm intervall preceding the last glaciation. During this time sea levels were 6 – 9 meters higher than at present. Temperatures for this period had been estimated to be either similar to today or nearly 2 degrees warmer. Hoffmann and colleagues constructed a comprehensive, global picture of sea surface temperatures during the last interglaciation by combining temperature data from 104 sediment cores distributed worldwide representing this period. Chemical and microfossil relations in these cores were taken as proxies for prevailing temperatures during sedimentation. 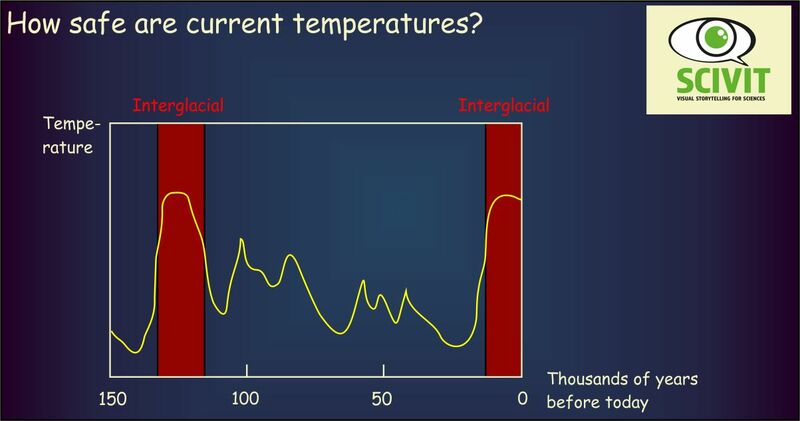 The data collected clearly demonstrate that 125 000 years ago today’s temperatures have been sufficient for creating considerably higher sea levels than today.